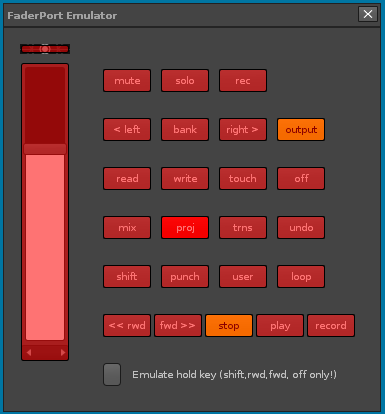 In 2010 I released a driver which integrates the Presonus FaderPort DAW controller into Renoise DAW. 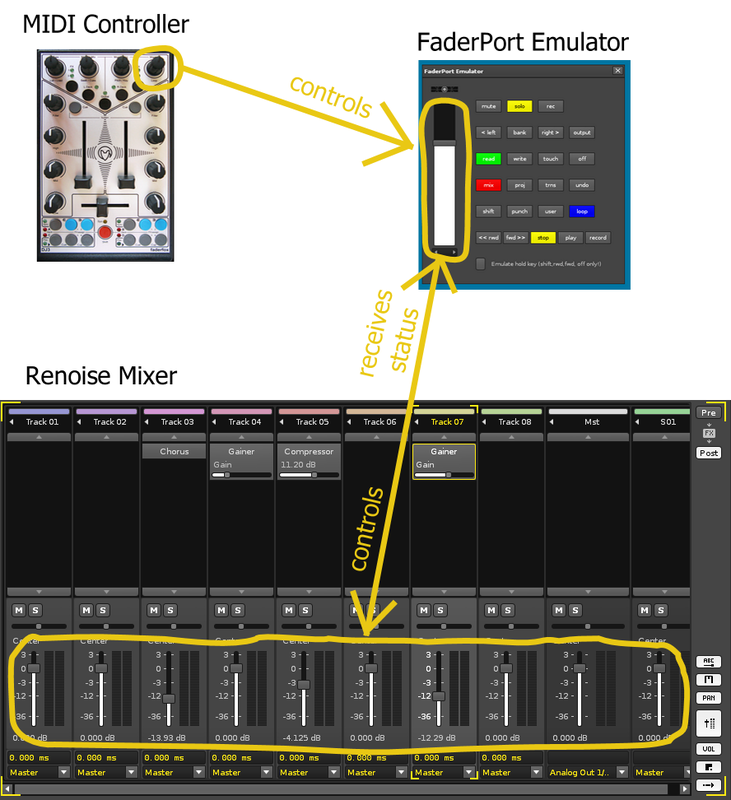 See http://blog.airmann.de/renoise-driver-for-presonus-faderport. Since then, Renoise has evolved to version 3.0 and I updated the driver regularly. Nonetheless, the day will come when the FaderPort hardware won’t be produced anymore and without further development the driver will be useless. All buttons and controls – especially the fader – can be MIDI-mapped to any 3rd party midi controller. 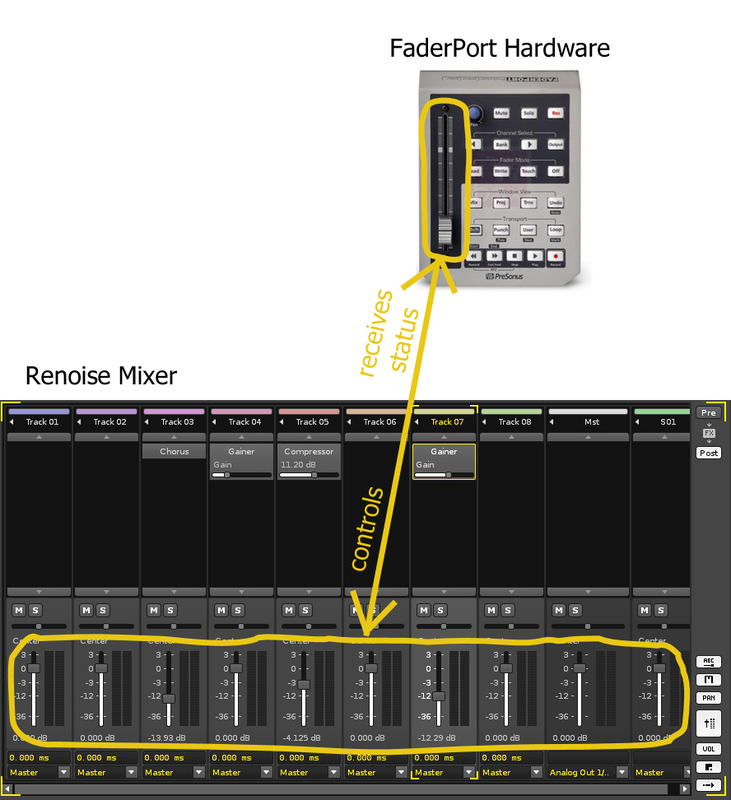 Renoise Integration Of Real Hardware The FaderPort’s motorized fader controls the volume level of the currently selected track. Whenever another track is selected, the FaderPort changes it’s position according to the new track’s volume level. Analogue the FaderPort’s buttons (like play etc.) control Renoise and also reflect Renoise’s state. The emulator’s fader controls the volume level of the currently selected track. Whenever another track is selected, the fader changes it’s position according to the new track’s volume level. 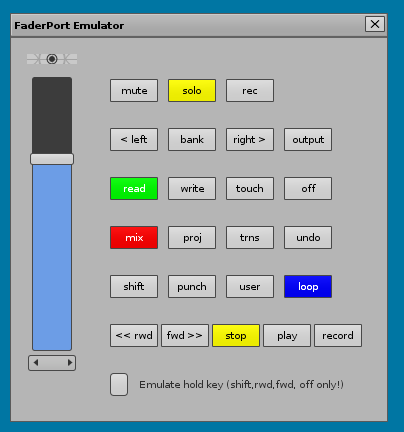 Moreover, it is possible to midi map any midi controller to the fader, pan and buttons of the emulator GUI dialog: In the example above an endless rotary knob is mapped to the emulator’s fader. Means: whenever the knob is turned, the volume level of the currently selected track is changed. The big advantage: regardless of how many tracks a song has, only one rotary knob can control them all ! There’s no need for a huge motorized mixing console etc..
Hey, thanks for your huge effort to make this wonderful driver for Renoise! Hey, I really appreciate the effort put into this. It doesn’t seem to work with renoise 3.1 though! you have to open the tools faderport Folder and edit manifest.xml. Change the API version from 4 to 5, restart Renoise and then it should work.